You're getting so much info here; how Yoshiwara was formed and how it would evolve during the 4 centuries it existed, ranks, how ranks changed throughout time, traditions, all sorts of stories and accounts, an overview of political climate and how it changed with time and affected the quarter. Geisha are a part of the story, so they are mentioned, but they are not the focus. 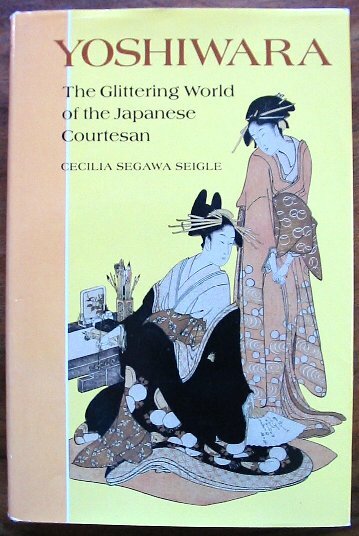 It includes all sorts of images, view of Yoshiwara's layout at different times, loads of scans of ukiyo-e and such. Only fault I could find with it was that there wasn't much about their attire (I'm interested in such things), how this rank wore that and that rank wore this sort of thing. I would have liked to know how to tell the difference from Hashi (lowest class of prostitutes) from Koshi( second highest to tayuu) and chusan from Yobidashi Chusan etc, etc. It's said that the elaborate style of Tayuu and Oiran we see in many old pictures, did not come about 'till very late in Yoshiwara's history, during the end of the 18th and the beginning of the 19th century (but that's when the decline of the quarter was about to begin). I would have liked to have more information (there is some, mind, but nothing detailed) about how they dressed then before, but perhaps it is not so abundant. It's an expensive book, costing 47$ on amazon (without shipping), but it's definitely worth it. Else I recommend you try to find it in a library somewhere (I couldn't find it anywhere though, not even in the biggest library in my country o.O) or an online library and read it online for much less (I did that, though not intentionally. Never used that site much, until I found that book there by chance, while looking for something else).